I was required to add a new integer type column with an identity property to an existing table through SSMS designer. The operation failed and generated a timeout message. The table was large and I expected it would take some time for this task, but I didn’t think it would have a timeout issue. In this tip we look at how to set this timeout value as well as look at other timeout values that can be set for SQL Server. To simulate the timeout error, let’s create a table with 500,000 rows. We will use this for the examples. 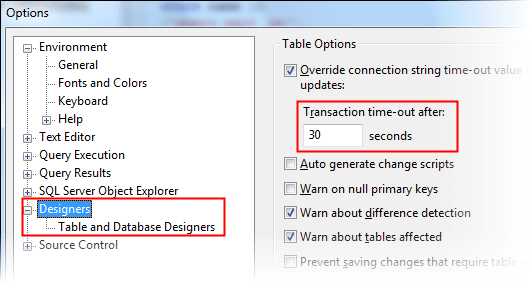 Transaction timeout for SSMS Designer operates only when SQL Server object modification is performed through the SSMS Designer. It is not a server level parameter and may be viewed or modified in the ‘Designers’ link in the Options menu of SSMS. Its value can be different for each SSMS client and is not stored as a server level configuration. To check or change this setting, within SSMS go to Tools > Options and click on the Designers link in the left panel as shown below. The default value is 30 seconds, but for the timeout simulation let’s change it to 1 second and save the changes. This is the T-SQL that SSMS generates and is trying to execute. We can see here that it is just doing an ALTER TABLE with the ADD option. If we try to add the EmpID as the first column, as shown below we can see that SSMS generates a pre-save warning that this will take some time. . This is the T-SQL that SSMS generates and we can see that this is a much more intensive script that drops and recreates the table. So if you face these timeout issues when using SSMS to make changes you now know the exact parameter to manipulate. The solution to this problem is to increase the timeout limit for Designer. 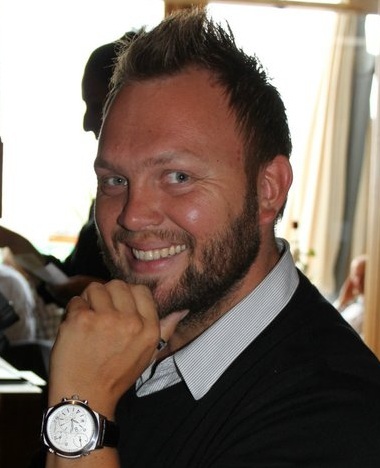 The specified limit would be implemented for any sever connected via that SSMS connection.